Early on in my herd, I made a buck decision that would influence not only my own herd, but the dairy’s Nigerian Dwarf herd for years to come. From the moment I saw his picture along with his sale ad, I knew I wanted him – I just had no idea that he would become, effectively, the father of my herd. His name was Blizzard, he was well bred and beautiful, and listed at what seems like an insanely low price now. My only obstacle was how far he was – six hours! Thankfully, my good goat friend was making a goat buying trip, and I tagged along. We picked up a great many exciting goats that day, including both Blizzard and his sire, Pride of Texas John. I was smitten of course – my new buck was everything I would come to covet in my herd, and he was sweet and gentle as well. At the time I only had a few does, but I put him right away with a sweet chocolate girl named Bunny. The results were a beautiful little blue eyed girl, and a black buckling covered in moonspots. That buckling is still around – our wether Commando with his ever changing coat of colors, Blizzard’s first son. 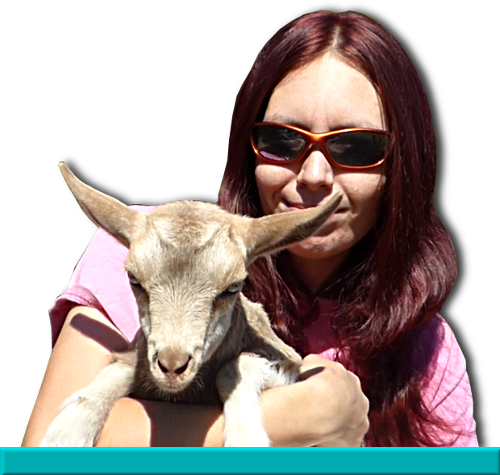 As I had few does for him these days, I traded him back and forth often with my goat friend I’d gone with to get him. She had some beautiful kids as well from him, and he sure saw no lack of action in his youthful years. The funny thing about Blizzard is I never actually saw him breed a doe – he was a night breeder, preferring the cooler air, and terribly lazy about flirting with his does. Several times I figured nothing happened at all, only to get evidence to the contrary five months later. Even with his small size, he was able to settle the two big Mini Nubians I have, producing flashy beautiful kids, though most were bucklings. At that time I was on quite the buckling streak – JuneRose was the first doeling I produced along with her sister, and it was her who would produce Blizzard’s most recognized daughter, the very doe who is in my logo. When I met Honey Doe Farm and became friends with them, I saw a wonderful opportunity. Their herd was full of beautiful solid does, but was lacking one thing – color. It wasn’t long before I loaded him into the truck and brought him over to stay at the dairy and visit their does. I didn’t realize at the time that I would be at the dairy to witness the birth of all those kids, but I was. That first kidding season at the dairy was a challenge – I’d gone from handling four or five does in a season to almost a hundred! The reward however, far outweighed the work, as the Nigerians offered up the most beautiful kids I’d seen yet, in all colors, some covered in spots, many with their sire’s bright blue eyes. There wasn’t a single blue eyed goat on the farm before I came with Blizzard if you can believe that! Oh I can’t lie, I greedily kept so many kids that year! Tempest, Windstorm, Moony – along with many others. And when we repeated Blizzard’s lordship over the does next season, we kept even more – Catnip, Saffron, Anise – just to name a couple. It ended up being his last season – if dear Blizzard had one fault, it was a predisposition to delicate health, and when the drought ended and the wetness brought the parasites with it, he struggled. At the end of his final breeding season, I found him curled up as if he’d gone to sleep, gone from us. A loss I felt keenly, and I’m grateful we kept so many of his daughters – and even a couple sons. To this day his progeny stand out in the herd, and not only does he have many daughters here, we now have even more granddaughters and even great granddaughters. I have absolutely no doubt that his lines will continue to dominate our herd for as long as possible. They just have the whole package – color, beauty, friendliness, and a good producing udder between the hind legs. His does freshen with nicely shaped udders that explode into production as second fresheners, and it carries through to their own offspring. Their teats are plump and easy to milk, and all of them have been much hardier than he, thanks to their dams. Blizzard will always be what I consider the father of my herd. It’s amazing to think that a $150 buck could change the entire course of our breeding program, and influence it for generations to come. He walked into the dairy herd and turned what was a pot of gold into a shimmering rainbow. To this day his descendants turn heads and catch the eye – they are my real stars. What I wouldn’t give for just one more season with him! So thank you Blizzard, for all you did for us. Thank you to the polite young lady who sold him for a song. Thank you to the great goat friend who drove six hours one way to pick him up. Thank you to the does who produced his offspring and made him into our farm’s legend.